This custom 8' stretch tablecover features all-over full bleed dye sublimation printing in full color. Perfect for attracting attention at trade shows and promotional events, the fitted accessory has built-in pockets that slide over table feet for a smooth fit. 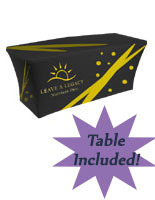 Each full-color imprinted 8' stretch tablecover has a fully covered back with a zipper closure. The lightweight polyester fabric is wrinkle resistant and machine washable. 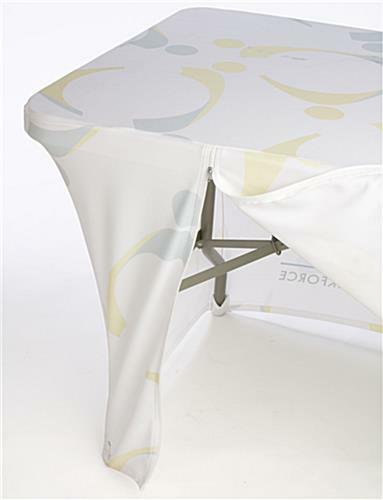 The printed stretch tablecover fits easily over standard 8-foot folding tables. 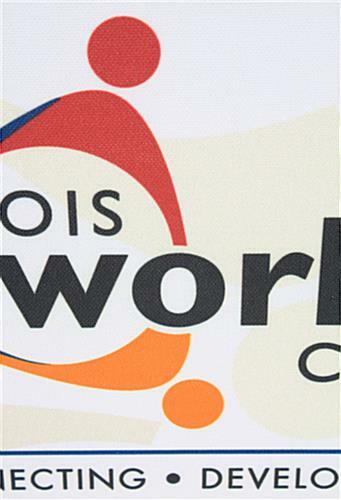 Full color graphics are ideal for logos, branded advertisements or images. Please note: Pricing based on single-image artwork. Orders with multiple graphics must be placed as separate orders.